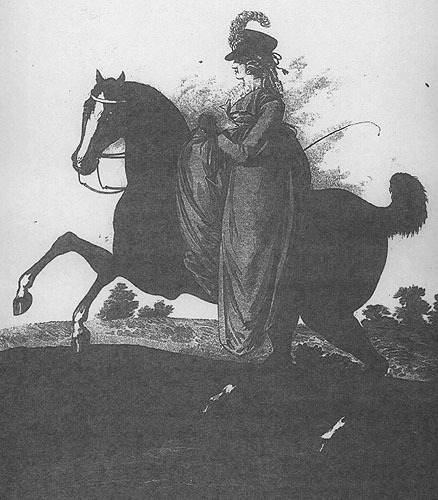 Riding Habit from Nicholas Heideloff's Gallery of Fashion, November, 1795, Fig. 76. [image not available] FIG. LXXVI. The hair in curls and ringlets; the hind hair turned up plain. White patent hat made of raw silk; two yellow craped feathers in the front. Riding dress of grey cloth. Waistcoat of yellow silk. Riding handkerchief, trimmed full round the neck. York tan gloves. Yellow shoes. Round beaver close cap, and feather in front, with gold chain band round the crown. Gold band of muslin cravat round the neck. 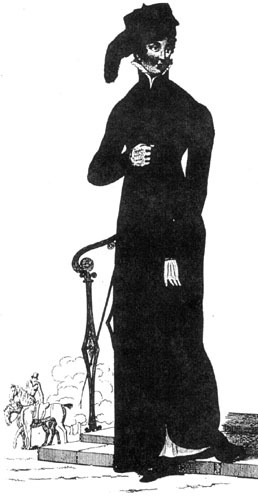 Blue, green, or corbeau jacket and petticoat, with black velvet collar, and double rows of Nelson's-ball gilt buttons; fine tan leather gloves; half boots of black Spanish or Morocco leather: a small quantity of hair appearing round the cap. This is without sleeves, and the slope is in the Greek fashion: it is worn over a white dress. It makes a very long skirt behind. The waist is plaited into fold, the front adorned in the same manner. It is of a very grand design, says citizeness Lissrand. Beaver hat of black or purple, with gold chain band and double feather. Habit of corbeau or blue, with ball buttons in double circular rows.--Black collar. Blue habit, trimmed with gold cord. Hat trimmed with gold band, and black feather in front. 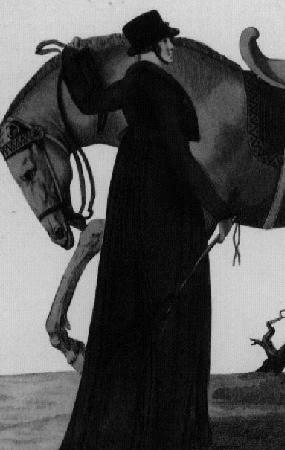 Riding Habit, 1803, from Journal des Dames et des Modes also called Costume Parisien (1797-1839). 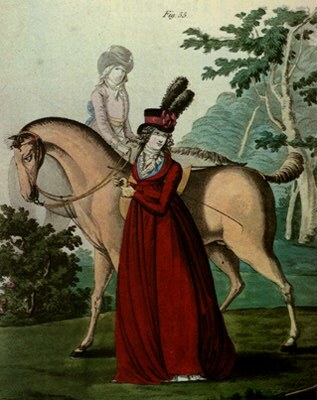 This riding habit is in the "Amazon" style. An [sic] habit of bright green, ornamented down the front, and embroidered at the cuffs à-la-militaire with black. Small riding hat of black beaver, fancifully adorned with gold cordon and tassels, with a long ostrich feather of green in front; or a green hat with black tassels and black feather. Black half boots, laced and fringed with green. York tan golves. When this dress is worn as a curicle or walking costume, it is made as a pelisse without the riding jacket, and confined round the waist by a fancy belt of black and green. This habit was made by Mr. S. Clark, 37, Golden-square. A stone coloured habit, trimmed round the body with swansdown, and ornamented entirely across the bosom with a thick row of rich silk braiding to correspond Waist much shorter than they have been worn for some time, and the sleeve longer and looser than those of the last three months. Regency hat of black beaver or seal skin, ornamented with an elegant feather of the same colour, and finished by a gold button and loop on one side. Large bear or seal skin muff; stone coloured kid gloves, and black kid sandals. Some elegantes wear silk stockings, to correspond with the habit; but white are more general. Riding Dress, 1818, from Rudolf Ackermann, The Repository of Arts, Literature, Commerce, Manufactures, Fashion, and Politics, 1809-1829. Braiding runs up the front of this riding habit.